Richard Stubstad, the person who once worked with Dr. Ketchum in sequencing the Bigfoot DNA samples released an article updating us on what he discovered during his research. He has provided compelling evidence, hopefully proving once and for all that Sasquatch does exist. You can read his article by clicking here. The article is located at www.sciencealivenews.com a website Stubstad started in June of 2011. The website is "dedicated to the on-line publication of serious scientific articles not normally addressed in contemporary mainstream media outlets." "In fact, these two samples could either end up proving the existence of a reproductively viable hybrid hominid species or the DNA results may end up indicating that sasquatch is a 100% human (stoneage or ancient) race or tribe." "The resulting outcome was extremely unexpected, because—hold your hat!—both samples tested 100% Homo sapiens (human), not a new hominid as the most serious and credible sasquatch researchers had long-since surmised. [Btw, as opposed to popular public and scientific sentiment, there really are some of serious folks out there working on this mystery.] However, having said this it must be kept in mind that mtDNA tests only reveal a tentative clue about the ancient mitochondrial (maternal/female) origins of a particular creature or hominid. If the paternal (male) origins, determined through analysis of the nuclear DNA (nuDNA) are also 100% human, then the results should also reveal 100% human DNA sequencing." "Since the nuDNA part of the species or subspecies-specific equation of these two samples is still unknown, we must qualify the following conclusions since we know very little about whether the creature called sasquatch (assuming here for the sake of argument that the sasquai truly exist as a living, extant hominid of some kind) is 100% human, or conversely a so-called hybrid species that is reproductively viable (non-sterile)." "While it is unusual for the male and female origins of a particular species to be different from one-another, it is certainly not unheard of. In all likelihood, such anomalies have occurred numerous times over the past million years or more. 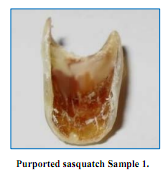 In fact, these two samples could either end up proving the existence of a reproductively viable hybrid hominid species or the DNA results may end up indicating that sasquatch is a 100% human (stoneage or ancient) race or tribe; or even possibly a much more modern feral human. Without the nuDNA data at our disposal, we still do not have the conclusions we seek." "As indicated in the foregoing discussion, verification that these two specimens—whether hoaxed, misidentifications or real-life sasquai—could be from a newly identified and extant tribe of Homo sapiens or feral humans is certainly not proven. All that is really proven by the above analysis is that both samples lead back—possibly far back into the late Pleistocene or later stone age—to an individual human (Cro Magnon) female that somehow got into the genetic mix—willingly or not—at least 10,000-15,000 years ago. While these data are not scientifically conclusive, they are nevertheless quite compelling and should provide the necessary impetus for further sampling and testing—not only on the mtDNA side but, even more importantly, on the nuDNA side." Maybe I'm missing something, but if these DNA samples appear to be 100% human, would that not indicate that the hair samples came from an everyday modern human, not some elusive ape-like creature running around in the forest. I agree, if 100% human is the result then it blows the evidence away as being from a "sasquatch" which is clearly not 100% human if the supposed videos and descriptions are any clue. 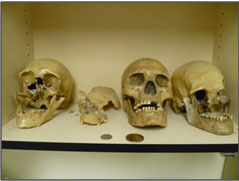 A cro-magnon would not appear too different from a modern human. It would not be a hair covered towering beast that has a different skeletal structure with a different foot mechanic etc. If they said a range, like the great apes or even Neanderthal, it would be more believable. The old term was Cro-Magnon...now it is Early Modern Humans. The biggest difference was really cultural...we are them...but further along. "...The physical characteristics of Early Modern Human are quite similar to modern humans, although perhaps a bit more robust, particularly seen in femora--the leg bones. The differences, which are slight, have been attributed to the shift away from long distance hunting strategies to sedentism and agriculture." The part that is interesting about this find is that it's an unknown haplogroup. The chances of finding two samples from the same unknown haplogroup in two different locations is rare. This study reports that only the mitochondrial DNA has been examined, and that only shows half of the subjects DNA. The more interesting information will come from the nuclear DNA because that shows both halves of the DNA. If it's an early human crossbreed , the other half of the nuclear DNA could be different. subject matter, which i am going to convey in academy.